Completely Customized! Lifetime Guaranteed! Why settle for less? There are tons of 'albums' for sale on the internet, too many (like hotel rooms) look their absolute best in the promotional photos, but not so good in person. We have the experience, honesty and expertise to give you the best quality at a fair price. All our albums include complete retouching, editing and professional design. We insure your album will be the best possible --Lifetime Guaranteed! We won't leave you stranded, but will help you along every step of the way. 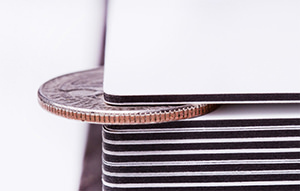 We won't sell any product we can't guarantee so for that reason we don't sell soft-bound albums or ones with paper-thin pages. We	don't	sell	'photo books' or 'press-printed' books that have thin paper photo copier pages. 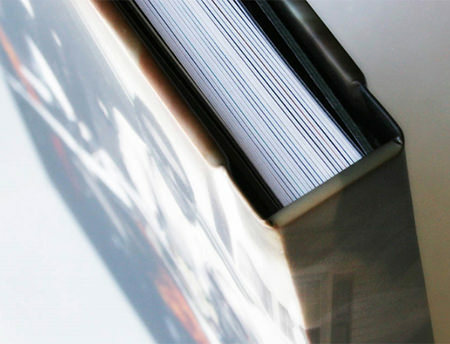 All our album pages are UV coated making them fingerprint proof, scuff-proof and water resistant. They have been tested to NOT fade for over 300 years. 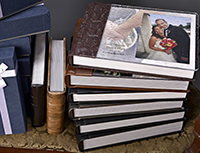 We offer several different customized Heirloom PhotoArt® albums: Matted, ThinBorder, FlushMount and LeatherArt, starting at $400. Every album we make is completely customized, hand crafted and lifetime guaranteed! Why settle for less? 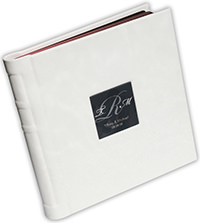 Scrapbooks and digital photobooks can't replace the quality of a genuine Heirloom PhotoArt® album. Let's be serious, you shouldn't look at your wedding album while floating in the pool or taking a bath. If you see an ad with an album splashing in a glass bowl full of water it's an advertising gimic. A 100% waterproof wedding album would have to be made completely out of plastic or some completely sealed waterproof material. Our album offerings include lots of cover options (such as leather or silk) that may not hold up well if completely submersed in water. If one of our albums accidently drowned or was caught in a flood, it would be covered under our limited lifetime guarantee and easily fixed or replaced. We have concentrated our efforts on protecting your album from the most common types of real-life problems, where it really counts, on the image surface. (So please don't go under-sea diving with it). Although your family will do everything possible to preserve your archival keepsake album, too often in a busy household accidents do happen. (especially if you have small children) Our UV coating protects from fading, fingerprints, scuffing and spills, even a permanent marker isn't permanent on our Heirloom PhotoArt® pages. 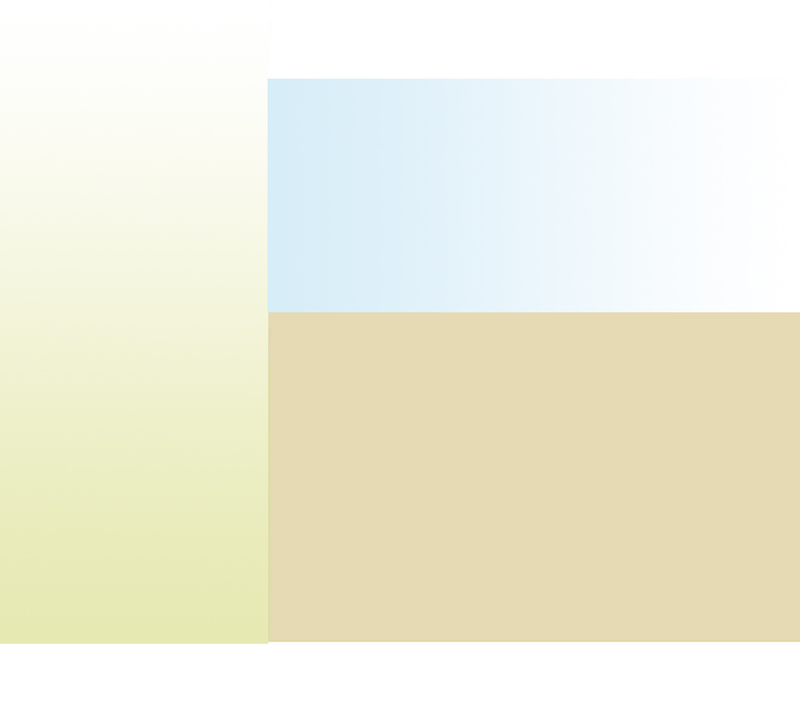 Optional Edge Colors Customized to match your event! 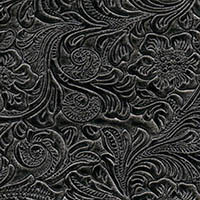 Our completely customized, designed Heirloom PhotoArt® LeatherArt album is the highest quality available. It is not designed from templates but each one is completely customized. Prices include all editing, retouching, design and your choice of words, poems, vows, lyrics, etc. 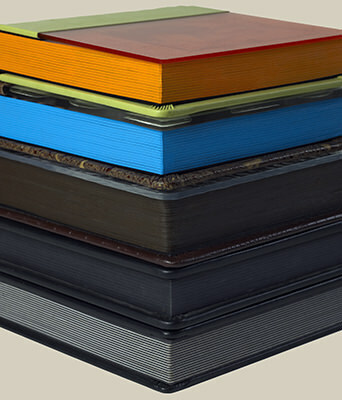 We apply a unique UV coating to the surface of every page for lasting protection and uncompromised quality. You have to see it to appreciate the quality workmanship. Click here to view a sample of our matted page design. Just as a frame enhances protects and preserves an original piece of art, so also your albums number one function is to enhance, protect and preserve your cherished photographs. We don't compromise on quality no matter the size of your wedding album or wedding budget. 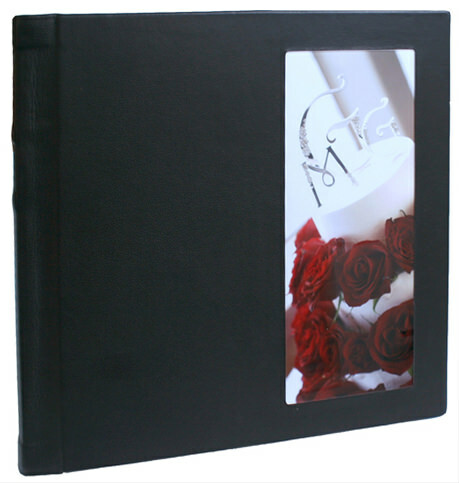 In keeping with our dedication to quality, for our matted albums we choose to offer ArtLeather's distinctive and unique 'top-of-the-line' Onyx, double-matted wedding albums. Our smaller packages have smaller wedding albums (not cheaper, or lesser quality ones) but they are the same brand, materials, quality workmanship and hand-assembled in the same fashion as our most expensive packages insuring the best quality for your photographic memories! Guaranteed to last a lifetime, the LeatherArt album is renowned for its outstanding quality and craftsmanship. Each LeatherArt album is hand-crafted to emphasize the beauty of professional photographs without distracting from them and allows you to showcase your treasured images and express your individuality with elegance and style! We will assist you in a complete customization of your own unique album. 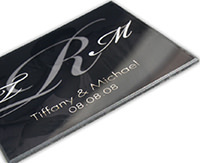 No additional charge for engraving, color choices, cover photo, design choices, etc. Every album is custom designed and hand-crafted, never pre-ordered. 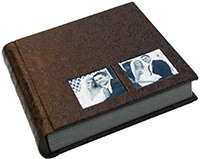 You can choose your page designs for your matted album from over 200 wedding album page styles. Your wedding photographs should last a lifetime for you, your special relatives and closest friends. 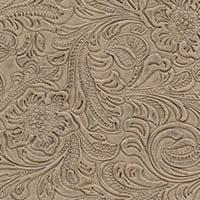 When you reflect back on your special day, your LeatherArt wedding album will be your personal storybook. 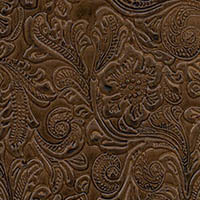 Your event, our images and Art Leather albums combine to create a custom keepsake destined to become a family heirloom. We take some extra archival steps in the creation of our album pages to insure long-term permanence. All photos in your album are protected by a UV photographic coating (choice of Satin or Hi-Gloss finish) with ultra-violet inhibitors -this seals the photo against dirt, moisture, fingerprints, scratches and ultraviolet light damage --the matte finish helps minimizes reflection so the photos are easier to view. We use only archival quality, conservation, acid-free tape (US Patent #4,725,498) on your images. (twice as expensive as regular tape) We NEVER use double-stick tape or acidic glues on the back of your photos because they eventually bleed through leaving a brown stain on the front of the image. All matted album pages are double-matted with archival board --not paper mats, (inset 1/16 of an inch) to insure that the photographs don't rub against each other and the pages have mylar trim and metal corners to prevent them from becoming dog-eared. 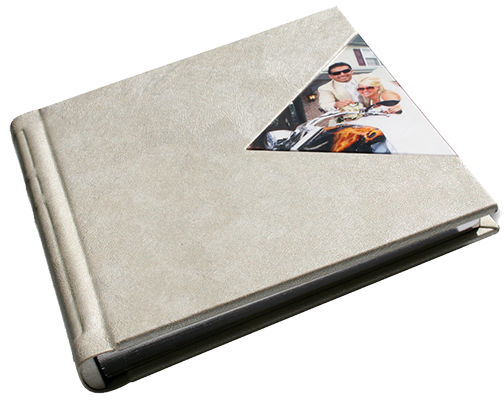 With the top-of-the-line Art Leather Futura album any long-term wear is on the easily replaceable matting material. If you ever have a problem with a page in your matted album we can easily fix it or replace it. A well-trained framer will tell you 'the frame should enhance, but never distract from the artwork'. There are a lot of albums being offered today that are graphically designed with crazy borders, backgrounds and special digital effects and wordy overlays that ultimately only distract from the photographs. We insure your album design will be modern and classical without become quickly dated. 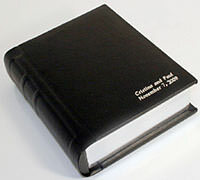 One of the many advantages of our 'black on black' Futura Onyx Library Conservation, double-matted album is it enhances the beauty of the photographs in a classically understated manner, without being distracting (or tacky), and still maintains all the archival characteristics required for a heirloom piece. 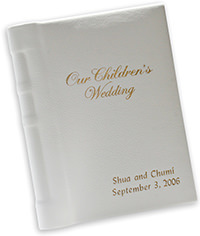 On our matted albums you can choose from 28 different wedding album cover designs and colors with imprinting and engraving at no additional charge (cover title choices). Our Contemporary LeatherArt Album has 85 different cover options all included in the initial price. The Futura album is the perfect backdrop for displaying both black and white and color images together. We don't just provide superior quality products, but also give superior service and assistance in helping to create your family heirloom. You can be involved as much as you want in the design of your wedding album or you can leave it up to our expertise. In either case, we allow you to preview and approve the design prior to production and again along each step of the process. You pick the pictures, we design, you tell us the changes, we re-design. IF, for any reason, you find a page or photograph in your matted album needs to be re-worked, we will gladly correct it for you at no additional charge! All photos in all our albums are individually color-corrected, re-touched and UV coated to make them the best possible guaranteed! All album design includes complete retouching at no additional charge. Call or E-mail to setup an appointment to see some actual albums and I will show you some key quality issues to look for in choosing an album. A recent bride said, "We weren't planning on getting an album in our package, but once we saw the quality that you offer, we realized it was really the best way to preserve our memories!" If an image is worth a thousand words, imagine the stories an entire box of images could tell. For those special moments captured in time, Art Leather has created the ArtBox. It's the perfect partner to a wedding album. This elegant and versatile presentation piece showcases your most memorable images in unique mats and comes with 2 easels used for a rotating display. While your album is your permanent storybook record of your special day, the Art Box allows for your most cherished images to safely await their turn for display as ArtWorks within your personal living space. Like what you see? e-mail your 'snail-mail' address and I will send you our uniquely detailed business forms. Standard Parent album of 40 pages or less is the same page style as the ThinBorder Album =1/16" Board Mounted. 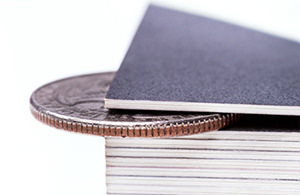 PhotoBook duplicate parent album > 42+ pages =1/32"
Pin-Hinge: metal edge on spine; size of the album expands as you add pages; unsightly; cheap. Screw-Post: expandable; often used in scrapbooks; pages are visible at the spine; the binding is only as strong as the paper used. 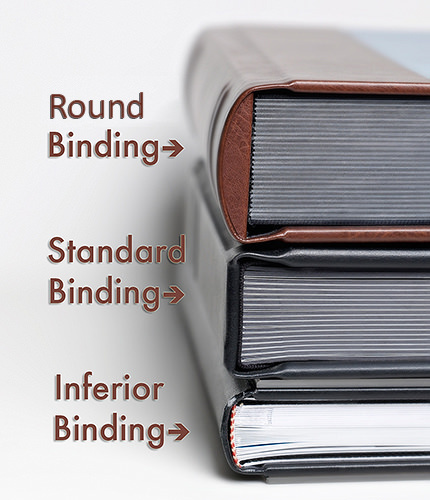 Library-Bound: pages sewn-in and bound like a library book; quality binding is easier to repair. Flush-Mount with heavy board: makes for a slick, modern presentation. Some inferior-quality board materials will warp in humid climates, be sure the album comes with a manufacturers/photographers guarantee. Too many pages in one volume (40+) makes for a cumbersome and heavy book. Photo book, magazine- style book: has thinner pages allowing for a greater number of pages while still keeping the album manageable. Some are printed with ink-jet printers or photocopiers on non-archival paper with glued binding (like a paperback book) . 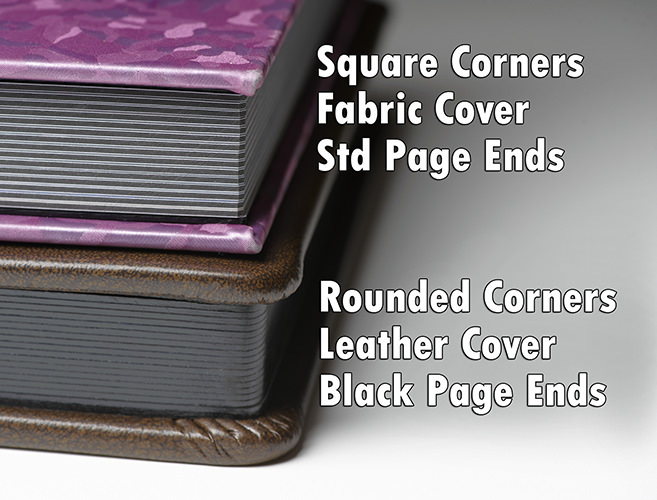 Art-Leather binding: Patented perma-bound system has the beauty of a library-bound spine, the strength of metal assembly and the advantages of removable pages, with exceptional photo and page-edge protection. 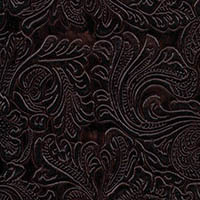 Unique cloth, vinyl and metal-pin, page-hinge system resists wear, guaranteed for a lifetime! If a problem ever arises due to manufacturing defects, ArtLeather will see that it is repaired or replaced, free of charge. If you ever have a problem with a page in your album Dan Harris PhotoArt will fix or replace that page (including the photographs). Please note: Due to color and clarity differences between computer monitors and programs, the color shades, lightness/darkness and clarity of these photos may not be correctly represented on this web site. For a more accurate representation, please set an appointment to view the originals.